For our final Off the Clock event of the season, we are celebrating misdirection and the mysterious. Plants and people are masters of illusion, and our own minds play tricks on us constantly. Fortunately, the results are often entertaining! Join us for an evening of entertainment where nearly everything is not as it seems. Hosted by Kaboom VR, our virtual reality arcade will offer guests the chance to choose from one of our virtual experiences that take them out of this world! Visit outer space, ride epic roller coasters or play mini golf in the clouds to take your mind off a busy week. Or, play a round of Beat Saber if you’re up for a vivid competition against yourself. Travel back in time and jam the night away to the classic rock tunes of Classic Vinyl Band. Converse with a puppet and their ventriloquist master from Rocky Mountain Puppets. Laugh it up with Voodoo Comedy Playhouse as they perform short-form improv on the main stage. Craft a 3D figure that magically transforms into its true form when viewed through a camera lens. 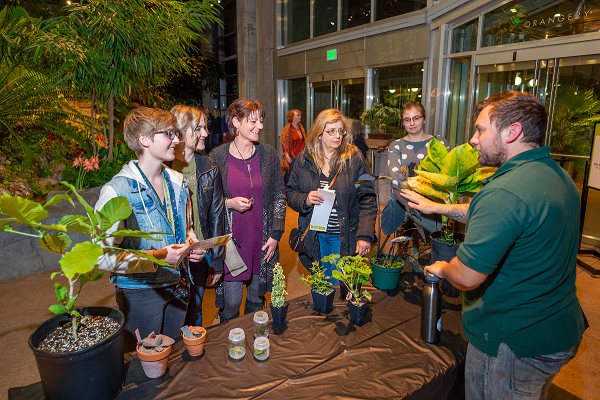 Gardens' horticulturists will show off some plants that use deception or mimicry to trick their predators. Learn about the lives of plants and play a seed dispersion game with our Research & Conservation team. Explore the possibilities with a tarot card reader or with a pair of mentalist magicians. Capture the moment with your friends and family at our complimentary photo booth. Test your trivia savvy at our Jeopardy-style trivia board of common myths & misconceptions. Can you find our featured plants in a game of I Spy? Perfectly Regular Food & Beverage That Definitely Won’t Trick You – Right? Check out our two cash bars for beer, wine or cocktails. Both cash and credit will be accepted at each bar. Offshoots Café will be open offering its full menu, however it will also feature a specials menu of treats that play games with their ingredients. Get yours early, specials may sell out! So join us for this night of trickery, illusion and entertainment! Tickets are limited, so purchase yours today online or at the Bonfils-Stanton Visitor Center. Ticket prices go up at the door.